Summer is starting to wind down, but Chicago&apos;s dance scene is certainly not. August rallies the Chicago dance community in two of the year&apos;s most inspiring cultural events: Dance For Life and the Chicago Dancing Festival, each one a stunning effort of its founders — Chicago-born dance artists with vision, purpose, and dedication that overflows with heart, soul, and some of the best choreography and dancing on the continent. Dance For Life (7:30 PM, August 20, The Auditorium Theatre), is a magnificent tribute to the strength and spirit of Chicago Dance. Originally begun twenty-five years ago by dancer Keith Elliott and Todd Keich as a means for Chicago dancers to take care of their own by dancing to raise funds for the care and treatment of fellow dancers suffering from the HIV/AIDS epidemic, Dance for Life (DFL) uses the art of dance to make a difference in people&apos;s lives. This event continues today and in response to the changing needs of Chicago&apos;s dance community, evolutions in the nature of HIV/AIDS, the growth of the annual event and its other programs, DFL has matured into a nonprofit organization, Chicago Dancers United. Continuing with its core concept of the dance community in Chicago taking care of its own, Chicago Dance United mobilizes Chicago&apos;s dance community to support organizations and dance community professionals dealing with critical health issues, including, but not limited to HIV/AIDS, through the art of dance. Dance For Life is a one-night-only celebration of some of the best Chicago dance has to offer. This year&apos;s 25th anniversary program includes: Giordano Dance Company, Hubbard Street Dance Chicago, The Joffrey Ballet, Chicago Dance Crash and Visceral Dance Chicago, with world premieres by Randy Duncan and Harrison McEldowney. Emcees will be Carisa Barreca and Tim Mason of The Second City. The Chicago Dancing Festival launches its 10th season of FREE dance performances with a unique line-up of performances featuring top dance artists and companies. The Chicago Dancing Festival kicks off its 10th Anniversary with the much anticipated return to Chicago&apos;s landmark stage, Auditorium Theatre. The Chicago Dancing Festival runs August 23-27 at various Chicago venues. Founded ten years ago by former Chicago dancers Jay Frank and Lar Lubovich, the goal was to expand the audience for dance in Chicago by exposing audiences to outstanding choreography and dance companies from Chicago and across the country and offering them at major performance venues free of charge. 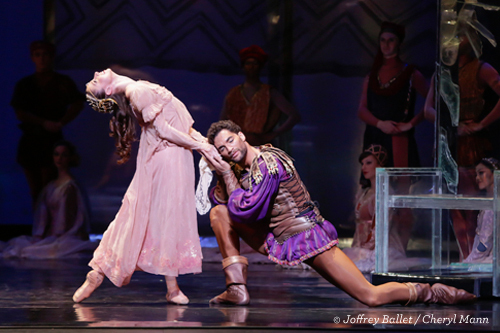 Opening night (Tuesday, August 23, 7 p.m.) presents Stars of the American Ballet in Who Cares by George Balanchine; The Martha Graham Dance Company in Appalachian Spring by Martha Graham; The Pennslyvania Ballet in Concerto Barocco by George Balanchine; and The Joffrey Ballet in Episode 31 by Alexander Ekman. The second program, "Modern Men," (6 and 8 p.m., Wednesday, August 24) features Aszure Barton + Artists in Awáa - trio section; Brian Brooks in solo excerpts from Some of a Thousand Words; Wendy Whelan and Brian Brooks; Joshua Beamish in Concerto by Joshua Beamish: Rashaun Mitchell + Silas Riener in Desire Liar by Rashaun Mitchell + Silas Riener; and Rennie Harris Puremovement in Students of the Asphalt Jungle by Dr. Lorenzo (Rennie) Harris. Program number three, "Dancing at the Harris" (Thursday, August 25 at 7:30 p.m.), presents Aszure Barton + Artists in Awáa - trio section; The Martha Graham Dance Company in Diversion of Angels by Martha Graham; Hubbard Street Dance Chicago in Solo Echo by Crystal Pite; The Joffrey Ballet in Othello duet by Lar Lubovitch; and Rennie Harris Puremovement in Students of the Asphalt Jungle by Dr. Lorenzo (Rennie) Harris. As part of its 10th year celebration, the Chicago Dancing Festival will be presented, for the first time, at Navy Pier on Friday, August 26 at 5:30 p.m. In a world-themed dance program titled "Planet Chicago", this presentation will feature Chicago-based dance companies including a Festival debut by Forward Momentum Chicago plus the popular returns of Chicago Human Rhythm Project, Muntu Dance Theatre of Chicago and Natya Dance Theatre. This presentation also celebrates the 100th Anniversary of Navy Pier and is part of its cultural and community programming, which is supported by the Polk Bros. Foundation. The 5th and final program of the Festival, "Dancing Under the Stars" (Saturday, August 27, 7:30 p.m.) features Chicago Dancers United in a new work created for Dance For Life by Randy Duncan; Hubbard Street Dance Chicago in One Flat Thing by William Forsythe; The Joffrey Ballet in After the Rain by Christopher Wheeldon; The Pennsylvania Ballet in Concerto Barocco by George Balanchine; Guest Artists of The Royal Ballet in the pas de deux from Romeo & Juliet by Kenneth MacMillan; and Rennie Harris Puremovement Students of the Asphalt Jungle by Dr. Lorenzo (Rennie) Harris. Inside/Out with Monique Haley & Miles Davis (August 5, Stage 773) offers audiences a last chance to go inside "Corner Sketches: A Tribute to Miles Davis" while it&apos;s a work in progress. Choreographer Monique Haley and Music Director Stu Greenspan will give you a final peek at this exciting work-in-progress and you&apos;ll be invited to discuss and interact with the piece and the artists, including trumpeter Pharez Whitted. This event is part of CRDT Inside/Out 2016 — a seven-month creative and audience engagement journey which culminates in the Fall Concert Series. You are invited Inside the company and its artistic process while the company gets Out of the studio to share work in progress and to be fueled by Chicagoans all over the city. THE ADVENTURES OF TAPMAN (2 p.m. August 6, Stage 773) follows Tapman, Chicago&apos;s premiere tap dancing superhero, through various episodes as he battles his arch nemesis, The MADD Tapper. Along the way, Tapman joins forces with The Modern Marvel, a crime-fighting modern dancer, in his quest to defeat The MADD Tapper. The Adventures of Tapman features light-hearted, 60s-era comic book humor, elaborate projected special effects, and phenomenal tap dancing including the unique tap dance fighting style, Tap-Fu! THRUST! (7 p.m., August 19-28, Stage 773) is a one of a kind double feature of tap and modern dance showcasing the work of long-time Tapman collaborators Tristan Bruns (tap) and Kate O&apos;Hanlon (modern) and special guest choreographer Ian Berg (tap). The pieces performed are created specifically for this thrust (three-sided) stage with elaborate props and set design, original music by Trainwreck Symphony and composer Carolyn O&apos;Brien, and new arrangements of popular music. "This performance is inspired by Ian&apos;s piece I saw last year at the Audible Odyssey showcase. Ian&apos;s choreography made use of all sides of the stage, effectively eliminating a "front" for the audience," said Bruns. "I thought, ‘I rarely see a thrust-style theatre used as is was meant to be used, where each performer and dance is viewed from three different sides at the same time. It is a difficult way to dance, so I must try it, too." "FEATHERS: A Tango Journey" (7:30 p.m., August 19-21, Ruth Page Center for the Arts) is Tango 21 Dance Theater&apos;s third original production. Three women meet by chance at an airport and share stories about love, loss and finding a path home. Tango 21 Dance Theater uses the language of Argentine tango to tell compelling and contemporary stories through live theatrical performances, featuring dancers, actors and musicians. Stage 773&apos;s "Inoffensive Family Series" presents art the WHOLE family will actually like! (2 p.m., August 21). Cerqua Rivera Dance Theatre fuses music, dance, and visual art to explore and celebrate contemporary American society in a journey through the rich history of American music and dance. You&apos;ll experience the New Orleans style of the early 1900s, the swing and big band phenomena of the ‘30s, bebop from the ‘40s, free and avant-garde jazz from the ‘60s, the jazz/rock fusion of the ‘70s, and influences of Latin, Indian, African, Rock and Soul — AND they&apos;ll invite you to boogie with them. Cerqua Rivera Dance Theatre&apos;s multi-disciplinary artwork is theatrical and thoughtful, vivacious and exuberant. This exciting show combines dynamic choreography, inspiring music, audience participation and much more, creating a treat for all the senses.